How important really is what we wear? Is there a cause/effect in how we are treated by the world? Does it make a difference in getting someone to help you in a Department store, or being seated at a good table in a restaurant? Can’t people look through all the superficial and see the real us? Fortunately, guys, we have some scientific evidence to support what you wear does make a difference in how you influence the world around you. Maybe we didn’t want to believe (but suspected) the real reason that guy down the hall who always dressed great, but didn’t know poop is now a vice president! When your credibility is crucial, in situations such as job interviews, court testimony, sales presentations and first dates (or even second and third dates) it is important to made a “good” first impression. Behavioral scientists tell us that this “first impression” is a strong one. And the process of sizing you up is on a subconscious/emotional level of the brain. Your evaluation by a stranger takes 30 seconds or less and can be so strong that it could take as much as five years to erase. Alexander Todorov, author of “Face Value: The Irresistible Influence of First Impressions” concludes that some people think a stranger is reliable if they look like someone trustworthy that they already know. Don’t you think it’s easier to make a great first impression with you appearance and then follow up by showing what a capable, impressive and trustworthy person you are with a winning performance? We’ve all heard the expression “You can’t judge a book by its cover”. If you agree, it’s a good thing you’re not in publishing. Publishing houses have long since proven that a cover may not tell you what’s inside a book, but the cover is the reason that we pick up one or the other off the rack. Until a book is picked up, no sale is made! A good example of “how you look being more important than what you say” is the first Kennedy-Nixon presidential debate. Radio listeners thought that Nixon had won while TV watchers gave Kennedy the win. Kennedy looked great, fresh and vigorous while Nixon appeared tired and rumpled. The TV audience gave more credibility to what they saw than what they heard. When I describe someone as an assistant manger at a fast food restaurant you immediately conjure an image of that person, maybe without much conscious thought. When I mention a high level executive you get another, different image in your mind. There is a definite picture of a person with credibility, authority and power – a professional image. Why not take advantage of the research on human nature and utilize the knowledge to enhance and control how you are accepted? The research reports that people notice the following about another human being and in this order. Remember this is a prehistoric/subliminal evaluation. We can do nothing about the first three, but we can work on the next four factors. 4. Bearing – This includes height (taller people receive higher starting salaries), head movement (nodding is negative with regard to perception of authority) and body language (smiling is perceived as weakness if overdone). But you don’t want to have a grumpy expression. Try a happy face without a big constant grin. Hands should be relaxed and visible. Face the other person and shake hands with your elbow at your side to project an impression of close contact and trust. 5. Appearance – Since about 90% of you is covered by apparel, the clothing you choose makes a significant impact. This is such an important area, and on in which you can effect the greatest impression. We’ll discuss it detail below. 6. Direct Eye Contact – Don’t stare, but look others in the eye 40 – 60% of the time, otherwise you’ll be perceived as having something to hide or that you don’t know what you are talking about. 7. Speech – 55% of communication is nonverbal. It’s not what you say, but how you say it. What you wear makes a difference in how you influence the world. Why not take advantage of this. Since 90% of us is covered with clothing, the clothing you choose makes a significant impact and one area where we can effect the greatest impression! Dressing badly can be taken as contempt for other people or the situation you are in. Clothing is a way to show others that you have respect and consideration for the situation. If you have respect for the theatre, you don’t show up in shorts and a T-shirt to a Broadway play. (The same goes for church, a job interview, etc.). So it’s not a question of being judged. We are judged thousands of times everyday. It’s a question of whether we want to have an affect on that judging or not. Are we ready to see what we can do to present ourselves in the best package to project a credible, professional image? Never wear a short sleeve shirt with a tie. Short sleeve shirts are perceived as lower class apparel. Fine as part of a uniform or if you aspire to be a fast-food manager, not if you want to project a professional image. Shoes are one of the most evaluated elements of men’s wardrobes. Your shoes should be clean, shined, in good repair and appropriate for the occasion. If you are wearing a suit, wear lace-up shoes. Don’t wear the same shoe on consecutive days and keep shoetrees in your shoes when you’re not wearing them. Trousers should be long enough to cover your socks, and socks should cover your shins even when you cross you legs. Pants are long enough if they have a slight break in the front. Pleats and cuffs are traditional and functional. Pleats let you sit down comfortably and cuffs add weight to the bottoms allowing for proper drape. Wearing both a belt and braces (suspenders) make you look insecure. One or the other please. And if you opt for the braces, please make certain they are the kind that fasten inside your trousers with buttons. It’s very easy to have a tailor or the alterations person at your dry cleaners put brace buttons on your pants if they don’t already have them. The metal clip-ons are for the guys who wear short sleeve shirts with ties. Socks should match your trousers. Belts should match your shoes in color and texture. 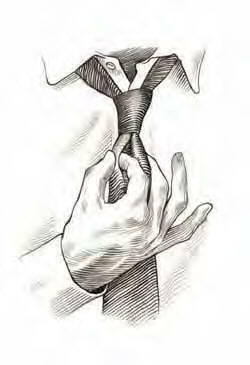 Ties should reach your belt line. This is neither arbitrary nor negotiable. Too short of a tie makes you look like a rube. 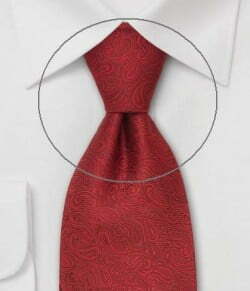 Properly knotted ties have a “dimple” under the knot. Clips and tacks are out of date. Suit and Sports jackets are symbols of authority. However the bottom buttons of men’s jacketsare not designed to be buttoned, since King Edward VII gained weight, and started a fashion trend (see detail below). Double Breasted suits are the more formal of the two styles and can have four to six buttons with one or two “to button”. They are often identified by a two-number designation such as 4/2, 4/1 or 6/2 (also “four to two”). Why do men never button the bottom button of your suit, sports jacket, vest or Cardigan sweater? King Edward VII, “Bertie”, son of Victoria (1841 – 1910, King 1901 – 1910) was so heavy that he could not get the bottom button fastened on his vest or to be more historically kind, maybe he just forgot. His subjects taking it as a fashion statement followed his lead and today most men’s suits, sports jackets or vests are not designed to button the bottom button. The tradition of not buttoning the bottom button may have also come from the early waistcoats, which were very long. It may have been out of necessity of being able to walk that the bottom buttons were left undone. Suit and Sports jackets should fit properly which includes showing ½” of “linen” or shirtsleeve at the jacket sleeve. No pens or pocket protectors in your shirt pocket. Pens go in your suit coat inside pocket, out of sight. Also applies to telephones, etc. worn on the belt. Think about getting a nice briefcase! Hair longer than shoulder length for women and over the ears for men diminishes perception of authority, but increases accessibility. We live in a complex, crowded society where considerate people dress appropriately for various places and occasions. Dressing appropriately is about respect for your fellow humans and our institutions. “Do the clothes suit you? Do the clothes suit the occasion? An update and confirmation from The Wall Street Journal! The Encyclopedia of Men’s Clothes.